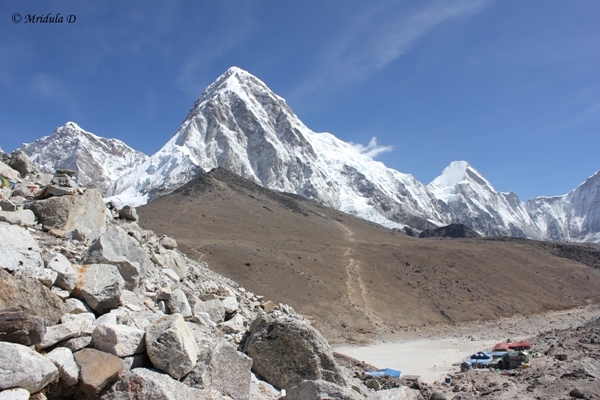 This is Gorek Shep, the last stop before Everest Base Camp Trek in Nepal. And what a trek it was! 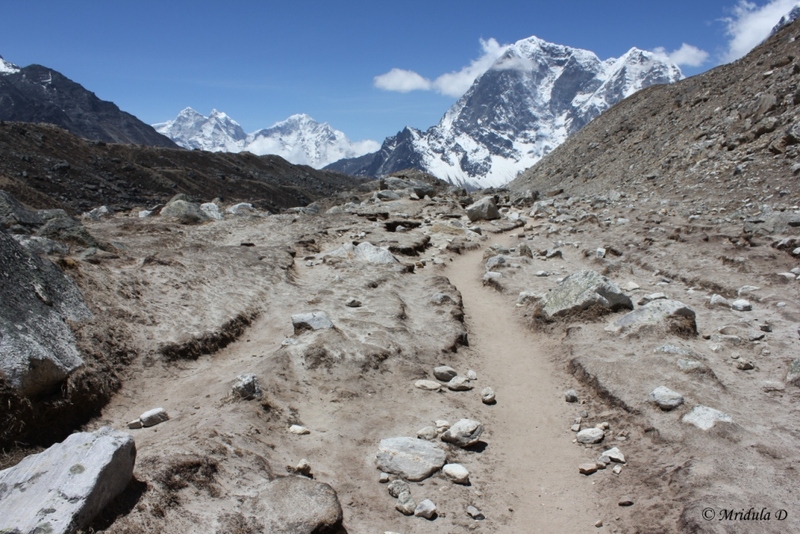 I decided to put all the links to my day by day account of the Everest Base Camp Trek in one post. It is easy to access them from here and easy to point it out to anyone who is interested in reading it all! Many thanks to all of you who read my accounts and a little more to those who shared their thoughts in the comment section or in person. This has been a journey of a life time! I had so many doubts in the beginning but in the end I was able to haul myself all the way up their and get down too! They say in the mountains, it is the mountain that decides whether you can complete a trek or not. I am glad they decided in my favor this time. 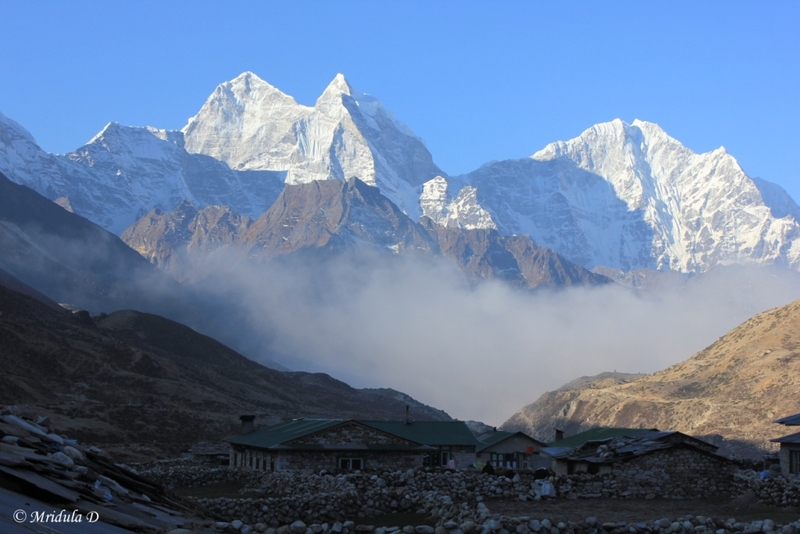 So here are the links to the detailed day by day account of the Everest Base Camp Trek in Nepal. 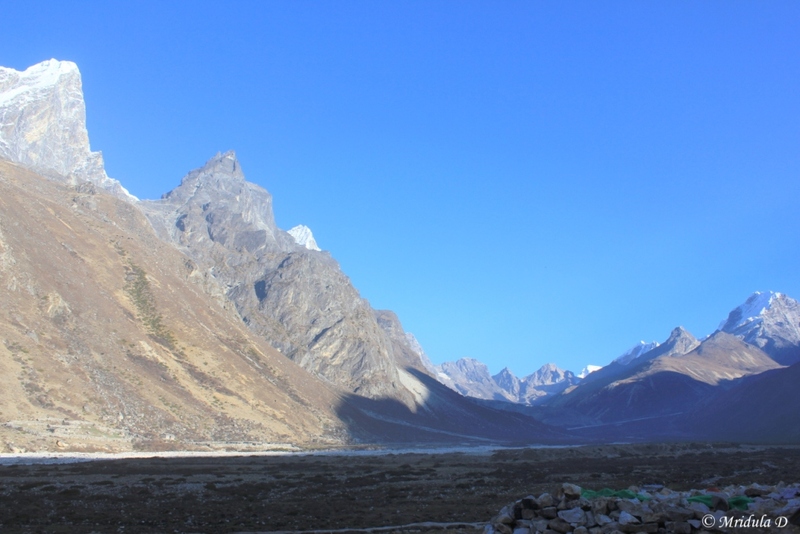 As I said in the previous post, I was at 3.14 am waiting for Deepak to start our trek from Gorek Shep (5164 meters, 16942 feet) to Kala Pathar (5545 meters, 18,192 feet). Deepak came out in less than a minute and we started our climb in torch light. I could see only a few feet ahead in the torch light and everything else was dark. I could see two torch lights ahead of us as well. It was cold but thankfully there was no wind. I knew the height gain was a lot but in the pitch dark I could at least not see it. Later I said to Deepak many time, “It is because of you I did Kala Pathar. You decided to start in torch light and by the time I could actually see how far we had to go, I already had covered a lot of distance. If we did it in day light when I could see from the beginning how far I had to walk, I would have refused.” And there is a lot of truth in it! And thus we climbed and climbed and climbed. On the base camp walk I could take 30 steps and then gasp for 15 breaths. Today I would take 5 steps and gasp for 30 breaths after a while. The pact between Deepak and me was that I would walk as far as I liked and not any further. But as I could see nothing of the distance to be covered so I just kept walking. At one point Deepak pointed out to my shoe lace that has come undone but instead of asking me to tie it, he just bent down himself and did it! I think I will never ever forget this kind gesture of his, he had guessed correctly that everything was costing me an effort. After an hour and a half when there was a faint light and I could see my surroundings, I had covered so much ground that it would be a pity to turn back now. So I continued. After a very painful walk upwards, I could see the vantage point and it was probably just 10 to 15 steps away (depended on what kind of steps I could take) and yet I just stood there, staring, I could not move. Here I was maybe 15 steps away from a good vantage point at Kala Pathar and yet I was unable to move. For the first time in my life, in presence of others I audibly cursed and then somehow moved. Finally, I was there and the two torch lights ahead of me were of Parvinder and his guide. His guide gave me a hand and pulled me up and got down himself to make space. I asked Parvinder to click a picture of mine and when I saw it on the display it was a very tired me staring back! Behind me is of course the trinity of Lhotse, Mount Everest (in the middle and it doesn’t look the highest) and Nuptse looking the highest because of being closest from this point. And then there was a play of light on various peaks. 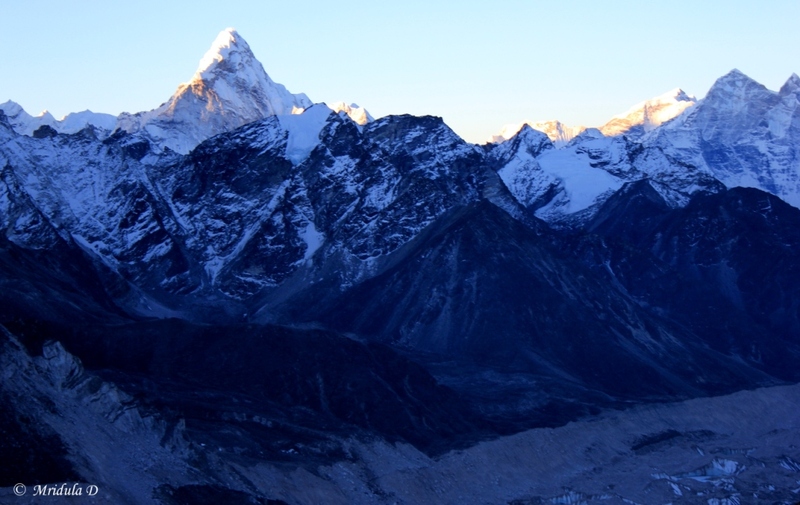 I first noticed Ama Dablam catching light. And then there was beautiful Pumori too, I only wish my brain was functioning at that point. I just clicked pictures without even thinking about composition. And then I waited for the sun to some out, so that we could get our sunrise shots and try and get out of the rocks I was perched on. Finally got that sunrise shot too at Kala Pathar. I thought I would take one shot minus Nuptse so that I won’t have to explain why Everest doesn’t look the tallest. 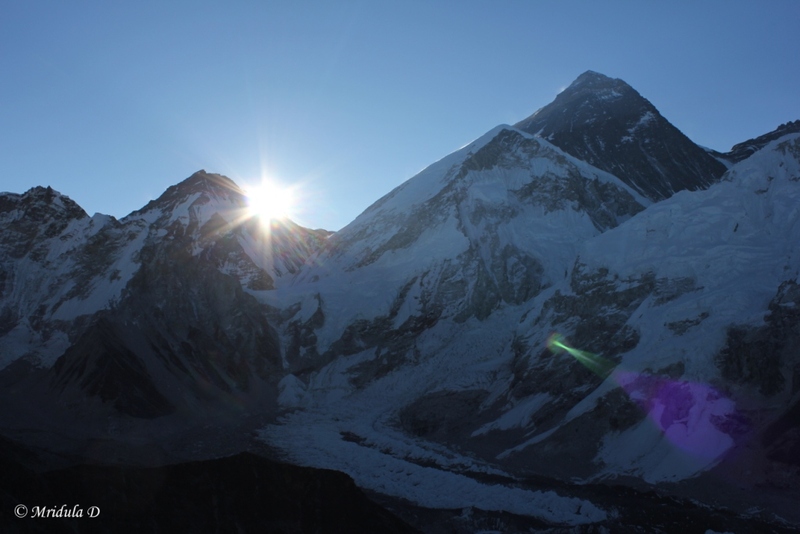 So here are Lhotse and Everest with the sunrise happening at Kala Pathar. 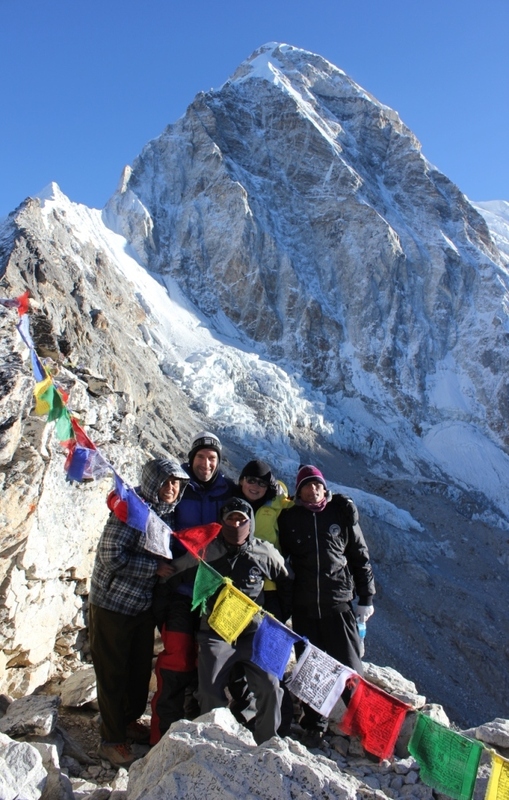 I got down from that stone with the help of a guide again and it was time for the group photograph with Pumori as the backdrop. When I was on the trek clouds would cover everything as a rule at the sunset, so I die of envy when I see pictures on the net of Everest or Ama Dablam glowing red at sunset. Also only after looking at pictures I realized that Gokarna never revealed his face for the pictures! 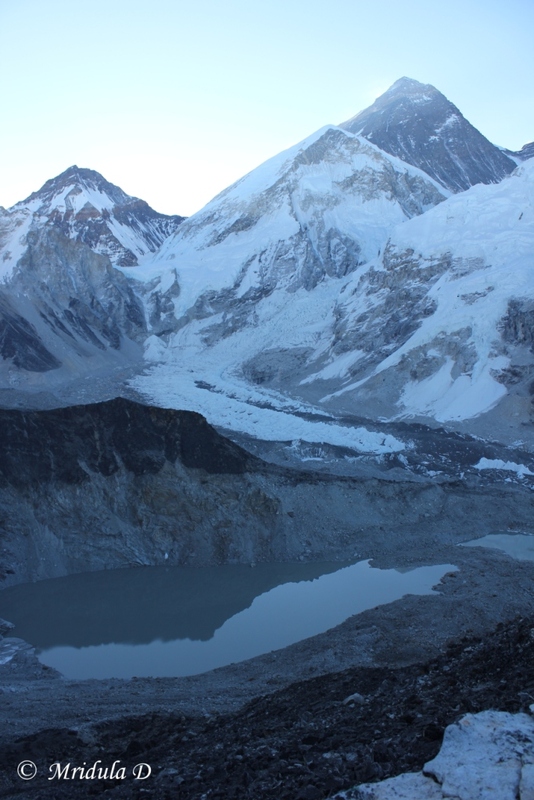 I earlier managed to get Lhotse and Everest with a water body but I was so tired I didn’t try moving an inch to get a better reflection in the water. I mean the brain would say move and there might be a better reflection but the body would just not budge and then brain would also forget. It was time to head down. So there was not much deliberate photography that I was capable of at Kala Pathar. As we started heading down it was fine for a while. Then gradually even while coming down I got the feeling that this walk was never going to end. 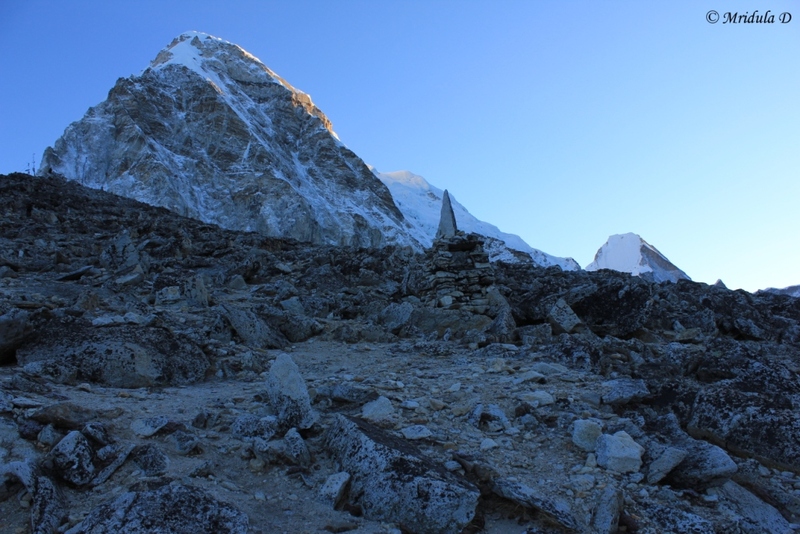 But end it did and after reaching the lodge at Gorek Shep I told Deepak that I would join him in a while. I went back to the room and slept for 20 minutes. Then I got down for breakfast. 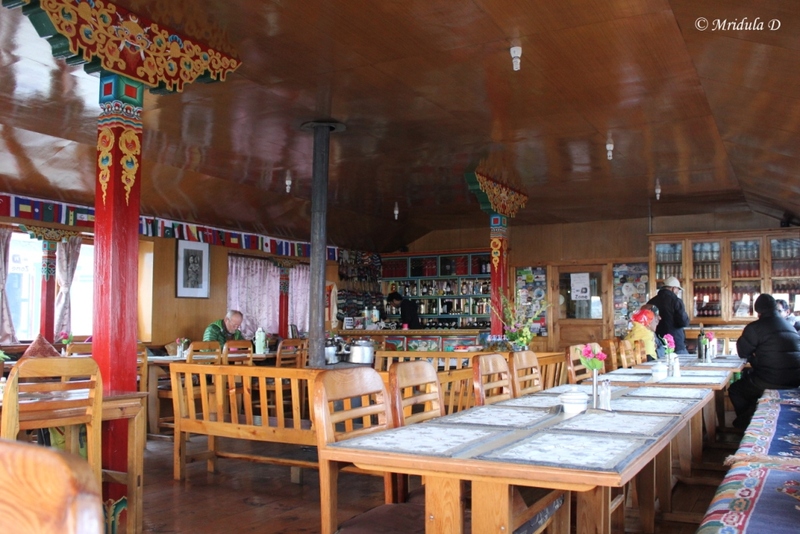 It was breakfast at Gorek Shep, lunch at Lobuje and dinner at Pheriche! Breakfast was Muesli with lots of milk. With some effort I finished it and it felt like such an achievement. You should have seen all of us that were staying at the lodge at breakfast. Breakfast was a struggle everywhere and the faces looked so fatigued. Then it was time to head down to Pheriche (4280 meters, 14041 feet) and I was looking forward to it so that I could eat some food and sleep at night. But before that we had to cross Lobuje again and it was our lunch point. As soon as we started back I also saw this bird, Tibetan Snowcock peeping out and this is the best I can manage after the crop. I don’t remember much happening till we reached Lobuje. I do remember the lunch vividly. We were a bunch that was by now familiar with each other because of walking on the same route for so many days. I had ordered potato wedges once again thinking that is was the fattiest thing on the menu and even if I ate a little, a lot of calories would go in. In fact, it was a very pleasant change to worry about eating more rather than managing weight. Once again I could see everyone pushing their food in the plate hence I didn’t feel too bad doing it my self. I ate four-five wedges and gave up. It was time to head to Pheriche so that the altitude would be manageable once again. It was a long walk from Lobuje to Pheriche but not a hard one. The trouble with me is that descend at almost the same pace that I ascend! So after a long march the valley of Pheriche was in sight and the wind was howling all around it. I once again felt like a hobbit who was running for shelter. Finally after starting at 3.15 in the morning I reached the Himalayan View Lodge at Pheriche at 5.00 in the evening, it was a 13 hour day. Not all of 13 hours meant walking but still it had been a long long day and my face in the mirror reflected that. It was almost black and I was a little taken aback at what I saw. I washed my face quickly and headed to the dining room for tea and dinner after that. The young man who was at the counter had spikes in his hair and looked so well groomed but then he was used to serving apparitions like me! I said I wanted an apple pie as a celebration for walking from Kala Pathar to Pheriche and he laughed readily and said it would be served. Then I sat in the farthest corner of the dining hall quietly with my book. Deepak joined me for a while and we chatted about the kind of day it had been! I met a a large group (18 I think) of Indians who were going up and they asked me many questions. Did I find it difficult? What to wear while going to the base camp and many more questions. They were all welcome. Then my Apple Pie arrived. I remember at the beginning I would take more food pictures. Later food either was too difficult to eat or went down too quickly. 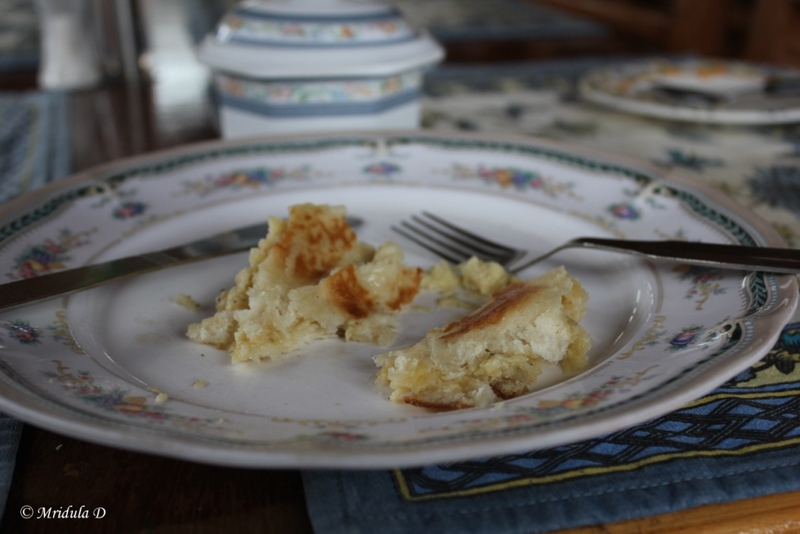 I managed to click the last few crumbs of the delicious Apple Pie I had, the best on the route. I shared the half of it with Deepak as our celebration. Then an interesting thing happened. Look at the photo of the dining hall and you would notice a gentleman in green on the left. He was with two other people and they were having a quiet chat. Suddenly a lady sitting on the table next to them (not in picture, this was taken much later) said, “Sorry to interrupt but I overheard and many congratulations on climbing Everest” to a person from this group. He relpied, “It was not at all a happy occasion and my friend died.” He body language was loud and clear, “leave me alone.” And thus I came to hear for the first time about the May 19 tragedy on the Everest. However, at that time I couldn’t comprehend much. Then on the table next to me there was a young man all alone. 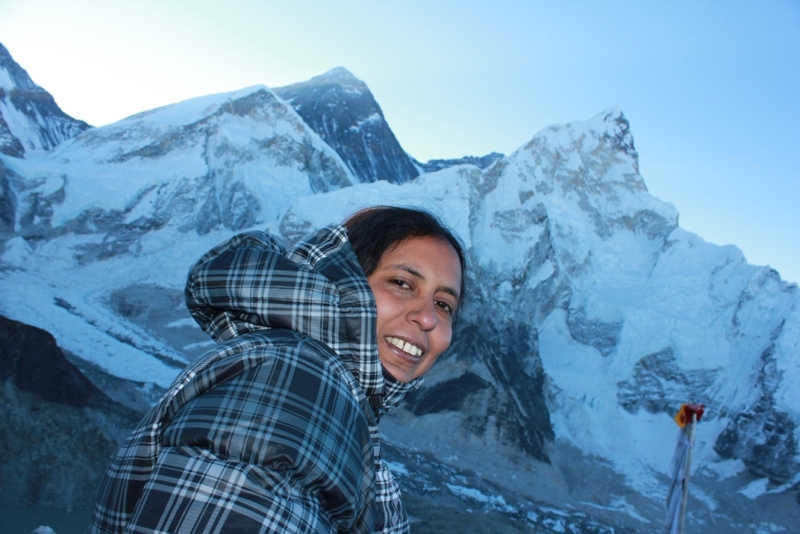 One of the Indian ladies started chatting with him and it turned out that he was an expedition guide and he went as high as Lhotse (it is a 8000 meters plus peak) while guiding his clients! I ordered a 6.30 dinner which was egg curry and rice and I ate it all and with speed. I remember someone asked me a question and then said, but go ahead keep eating. I added, “This was the first meal that is going down my throat today so yes I am very hungry.” And it didn’t even occur to me to click a picture of that meal! I slept like a log from 7.00 pm to 5.00 am at Pheriche and this was the view that greeted me next morning. It fully dawned on me that even though I was ‘only’ getting down I was doing two days of going up in one day while going down. 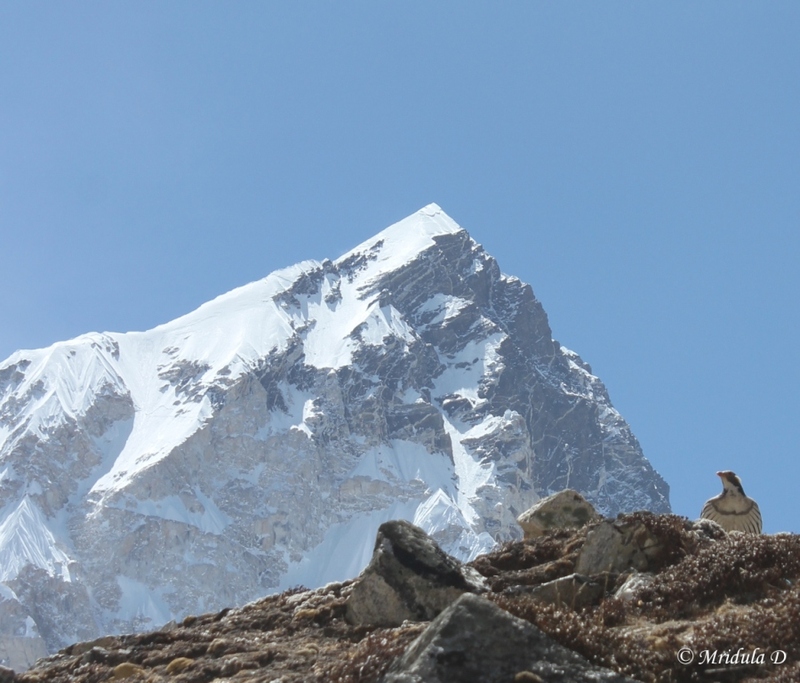 So instead of heading to Tengboche (Pheriche is a substitute for Dingboche) I was headed for Namche. How did I fare? I will tell you in the next post.